BUTTERFLY FRAMES WALL DÉCOR home decor, jewelry, decor, decorations, electronics, fountains, floor mats, art glass, vases, garden essentials, fireplace screens. The most lovely way to display three of your favorite family photos! A trio of wood picture frames hang from a metallic branch blooming with leaves and home to three gorgeously detailed butterflies. 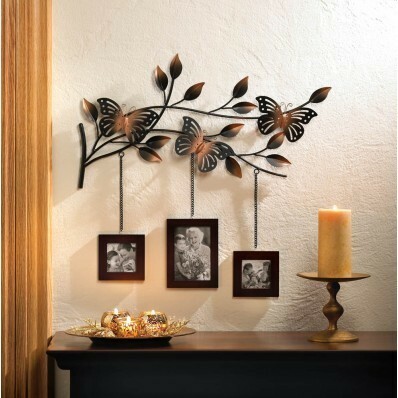 This fabulous wall decor will turn your favorite photo memories into an absolutely stunning focal point. Material(s): WOOD - MDF METAL. Weight 2.23 pounds, Dimensions 22.5" x 1.5" x 23".